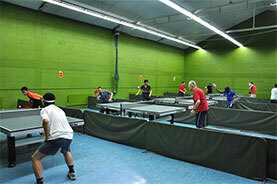 We hire out table tennis tables for a rate of £8.40 per hour. Phone 020-89422157 or email us for bookings or further details. Table tennis coaching is available by an experienced coach, please call David Bangerter on 07964-921555 for further details. If you are an experienced player, you may be interested in contacting the Graham Spicer Table Tennis Club who operate from within our premises, they are a Table Tennis England (TTE) Premier exellence level club who open 6 evenings per week for practice and league games. For further info and contact details please see their website.